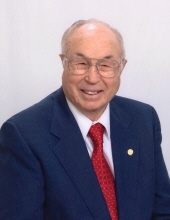 Louis W. Briscoe passed away Saturday February 9, 2019 at the age of 95 in his home located in Yukon, OK after an extended illness. He was born December 6, 1923 in Capitol Hill to R.D. and Saphrona (Smith) Briscoe. He grew up in Mustang and attended Mustang Schools where he graduated in 1943. He lived most of his life in the metropolitan area near Mustang and Yukon. He was a loving husband, father, grandfather and great-grandfather who had worked in the ranching and farming business with his partner and wife of 63 years, Wilma J. Briscoe. In 1943 Louis joined the Merchant Marine. After his training at the Maritime School in Sheepshead Bay, New York Louis sailed in both the Atlantic and Pacific Oceans. In 1946 Louis was honorably discharged with the rank Jr. Engineer. In 1961 Louis was Worshipful Master of the Mustang Masonic Lodge #407. He was presented with his 70 year pin by the Grand Master September 29, 2017 in Mustang, Oklahoma. Louis was preceded in death by his parents, three sisters, Evelyn Franks, Lucille Diver and Nellie Ramsey, two brothers, Bernard Briscoe and Donnie Briscoe and beloved wife, Wilma J.
Briscoe. Survivors include his daughter Linda Blackburn of Yukon, OK, grandson Matthew Scott Blackburn, wife Nicole, two great-granddaughters Cheyenne Marie Blackburn and Makenzie Skye Blackburn of Bridge Creek, OK. Louis is also survived by companion and caregiver Connie Lane. To send flowers or a remembrance gift to the family of Louis William Briscoe, please visit our Tribute Store. "Email Address" would like to share the life celebration of Louis William Briscoe. Click on the "link" to go to share a favorite memory or leave a condolence message for the family.